Custom double hung windows save you money, bringing beauty and appeal to your home in the Dallas-Fort Worth area. If you’re replacing existing windows in your home, consider double hung windows for a traditional look with a side of convenience. Energy efficient double hung windows are the most popular replacement windows in Dallas and Fort Worth. 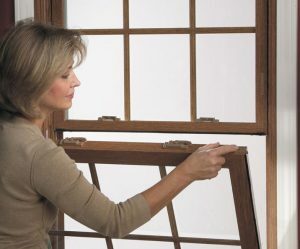 These windows provide upper and lower sashes to open for daily fresh air to come in, as well as have an inward tilt for quick, easy cleaning. Double hung windows are a natural fit for almost any type of home, and Best Buy is your replacement window specialist. Most important to you is the energy efficiency and minimal maintenance your double hung windows require. Each window we install is custom made to meet your needs, adding value to your home as a high quality upgrade with curb appeal. Our custom designed double hung windows use vinyl frames and sashes. No cracking or warping frames, and no chipping or peeling. The vinyl we use in our frames prevents loss of the color gloss, and helps eliminate scrapes or the need for future painting. The tilt sashes allow for top or bottom ventilation and make cleaning windows inside and out easy. The combination of compression seals and fin seal weather stripping help reduce household dust and allergens in your home, eliminate cold drafts, and reduce outdoor noise. Security and safety are paramount, because we use heavy duty steel-reinforced meeting rails, locks, and keepers. You still get great ventilation when you want, while keeping your children and pets inside. A heavy duty screen system is created with extruded aluminum frames and sun protected splines. With no strings or springs, the stainless steel constant-force balance system adds beauty and longevity to your window operating system. One common problem many homeowners encounter is the dropped window. This occurs when the sash of double hung windows disconnects from what is called the balance shoe. When this happens, the window will drop or slide down when you try to raise it. While some people try to fix this problem on their own, it’s better if an expert does the double hung windows repair. At Best Buy Windows and Siding, our professionals will repair your window and guarantee your satisfaction. When pricing double hung window replacement, several factors can influence the price. The frame, glass customization options, and installation will all contribute to the overall price. Best Buy Windows and Siding guarantees all its double hung windows. To find out more, call us at 214-736-9971 and speak to one of our window experts today.